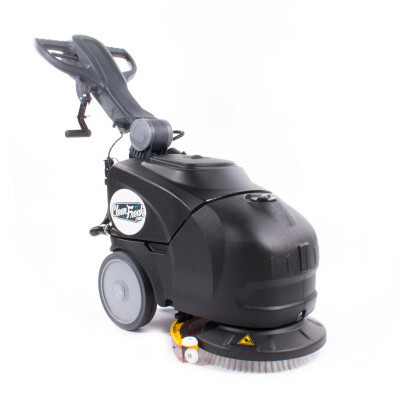 CleanFreak® Reliable 14 (Electric & Battery) Floor Scrubber - Buy a Compact Walk Behind Auto Scrubber Today! *Please Note: We currently have the IES-14B (battery version) on back order until 3/31/19. We have reduced the price by $200 (from $2,349.99 to $2,149.99) for those individuals who are willing to wait for the back order. Please give our customer service team a call at 888-722-5508 if you can't wait until the end of March and need a machine delivered ASAP. We do have more expensive alternatives that we can price match at the initial $2349.99 price, so please give us a call if you have an immediate need and can't wait for the back order. The CleanFreak Reliable 14 auto scrubber offers unbeatable features in a compact package. It comes with a "Hands-Free" 14 inch nylon brush that spins on and off with no tools required. The operator never has to bend down to attach the brush, making it extremely easy to swap. The Reliable 14 provides many user-friendly features such as a removable recovery tank that makes discarding dirty water a snap. The height-adjustable handle allows for the comfort of many different users, not to mention easy transportation and storage as the handle folds completely down. A great thing about the CleanFreak Reliable 14 floor scrubber is that it is available in both battery operated and cord electric versions. The battery model will give you approximately 2 hours of run time on a full charge. The electric model obviously has unlimited run time, as long as there is an outlet near by. Both models are compact and easy to maneuver, making it easy for any operator to use the machine. The tanks are built of high-quality, durable polyethylene giving each machine the longevity to work for years and years to come. Please take a look at our complete line of automatic walk behind scrubbers for other options, if this 14 inch model does not fit your needs. Single nylon brush provides a 14" scrubbing path. Both models come standard with brush & squeegee assembly, so they're ready to scrub as soon as you are. Brush-assisted drive allows you to easily push the machine around as you scrub. Under optimum conditions, the Reliable 14 will clean approximately 14,000sq ft/hr. Follow-behind squeegee swivels right behind the brush recovering 100% of the solution dispensed. Removable recovery tank makes dumping your dirty solution easy and allows you to clean the tank. The height-adjustable handle folds down for storage, and can be adjusted to a comfortable height for any user. The 14" Reliable electric powered model weighs 79 pounds, and the battery version weighs 105 pounds. Battery Operated - 130 lbs. / Cord Electric - 115 lbs. Customers who were interested in the CleanFreak® 14" Reliable Walk Behind Floor Scrubber were also interested in the following items. Super cool looking and actually works as advertised. I bought a battery and electric one for my garage and shop. Amazing how well that squeegee works and easy the machine is to use. The dump hose on the tank also makes it so you don't need to lift out the tank if you have a low floor drain. Awesome machine!! This is a review for the CleanFreak® 14" Reliable Walk Behind Floor Scrubber.